Ford has sold more new trucks in the United States than anyone else for a long, long time. There are, of course, good reasons for this. Ford continuously raises the bar on pickup performance, styling, and features. The latest truck to up the ante is the new-for-2014 F150 STX. The 2014 STX has the sport and style elements that lovers of the mid-level trim package have always enjoyed. As an option between the work-truck XL and the luxurious XLT models, the STX will continue to appeal to pickup buyers that want some flash to go along with truck utility. The new STX offers upgraded features such as body-colored front bumper trim, grille surrounds, and front and rear bumpers. 17-inch machined aluminum wheels give the truck a stylish stance. Standard is also the highly desired power equipment group featuring power windows and locks, integrated keyless remote transmitters, one-touch up/down windows, and an illuminated entry system with perimeter alarm. The already comfortable interior was enhanced as well. Upgrades include cruise control with a tilt steering wheel, an audio input jack, a customer information and outside temperature display, front-row premium cloth bench seat, an adjustable driver’s lumbar support, air-conditioning, and an AM/FM/CD stereo. For serious truck buyers looking for a little more personalization, Ford offers the new STX Sport package in any of the cab configurations. This specially-tailored treatment includes 20-inch painted wheels with P275/55R20 tires, a black billet grille, black tubular running boards, color-coordinated carpet, and unique seat material and box decals. The STX Sport package takes the already gorgeous STX and gives it a more custom, aggressive look. Standard equipment on the 2014 STX is the 302 horsepower, 278 lb.-ft.-torque 3.7-litre V6 engine. This economical power plant offers an EPA estimated 17 mpg city and 23 mpg highway rating. For buyers that desire a little more power, the 5.0-litre V8 is rated for 360 horsepower and 380 lb.-ft.-torque. When properly equipped the V8 option is rated to tow up to 9,500 pounds. 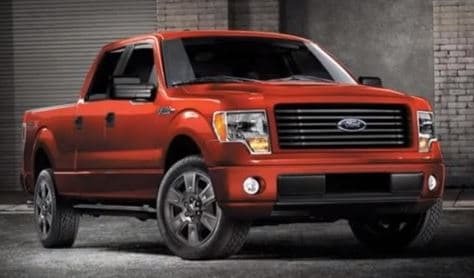 The new-for-2014 Ford STX F150 is sure to lead the pack in stylish yet functional pickups. With an aggressive street-tuned look and Ford’s “built-tough” heritage you can be sure to turn heads whether at the jobsite or taking the family out on the town.